Matt Brown was flying across the ice, just as his coach wanted. He gained speed as he chased the puck toward his defensive zone. The entire bench had their eyes trained on him, knowing something big was about to happen. And something big did happen—this play was life-changing, in the most unexpected, catastrophic way possible. Just as the puck settled between Matt’s skates, he was bumped from behind by an opposing player and crashed headfirst into the unforgiving boards. As he struggled to move his arms and legs, an ominously painful silence fell over the arena. In a split second, star hockey player Matt Brown was suddenly paralyzed from the neck down. 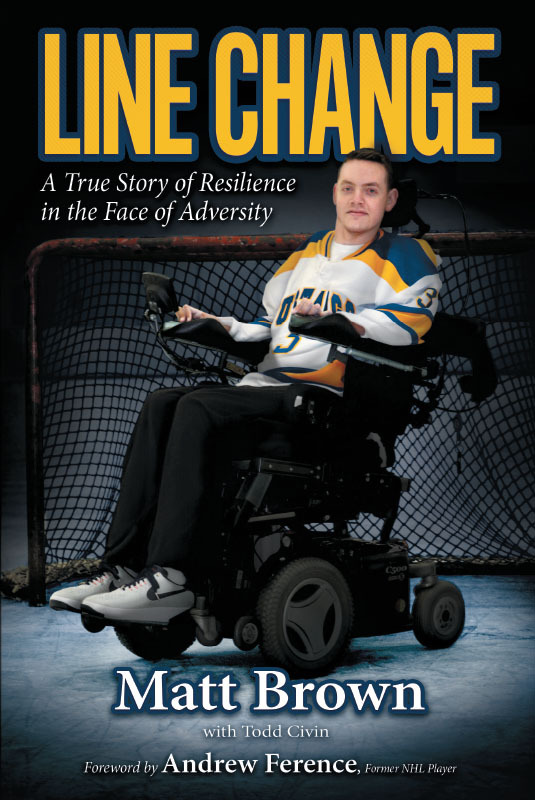 An inspiring true story of die-hard resilience in the face of adversity, Line Change is Matt’s unbelievable, first-hand account of what it means to square off with life’s setbacks. Despite facing tremendous personal and physical challenges, Matt never let his confidence waver, his drive falter, or his goals diminish. And though he may still be paralyzed, he works on his strength every day–and will continue to do so until he gains full mobility once more. In this searing, candid, and ultimately inspiring memoir that is interlaced with influential voices from those closest to him during his recovery and beyond, Matt lays his journey bare. From the struggles to the triumphs and everything in between, Matt reflects on how his “Never Quit” attitude allowed him to graduate from college, become a well-respected motivational speaker honored by the Boston Bruins, and be an inspiration to those of all ages. Line Change isn’t a story of tragedy, but a story of hope, courage, and what it means to live a full and rewarding life.